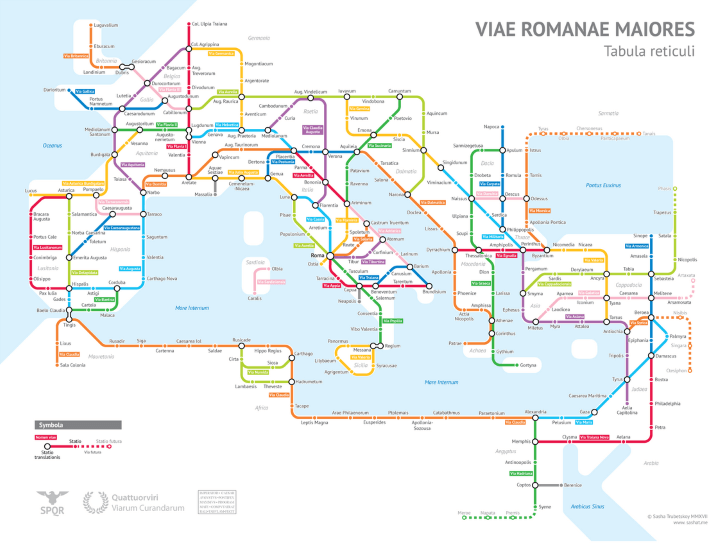 The map above is tube / subway style map of the major Roman roads around 125 AD. It is the amazing work of Sasha Trubetskoy and is largely based off the ORBIS Model of the Roman World and The Pelagios Project. According to the author in summer time it would take you two months to walk on foot from Rome to Byzantium (later Constantinople and now Istanbul) or around one month by horse. However, if you took a boat it could be done in around 25 days. The other roads have relatively uncreative names that I invented, usually based on a place that they pass through. You can see a full size image of the map here. Stop throwing money away on train tickets! Hi,I miss the Limes Germanicus in the Netherlands,shouls be north west of Col. Ulpia Traiana,Claudius did made the start.